Question: would we be better, worse, or about the same if we traded Marcus without taking back salary, and signed Michael Beasley? Significantly so? Enough of a difference to justify the repeater tax a year earlier? I don’t think so. I doubt having Morris over Beasley would result in even one additional win. Yes, significantly so. I’m going to rely on the market for this one, but Beasley has signed minimum salary contracts for the last 5 seasons, and has never been brought back by his team the following offseason (he had consecutive seasons in Miami, but in the offseason was signed and released by Memphis before rejoining Miami in March, initially on 10-day contracts). He is yet again a free agent. I don’t know exactly what it is, but there is probably a reason or reasons that he quickly wears out his welcome with a team and waits late into the offseason/into the regular season to sign somewhere after that team has exhausted other options. Morris has his flaws, certainly, but way too many teams have tried Beasley and not liked what they’ve seen for me to be willing to make that switch solely for tax purposes. Beasley's let's call it "defense" is such that he'd rarely, if ever, get on the floor, imo, which would only compound the error of moving Morris so as to save money as the team would then be wasting money on his replacement, LOL . Ugh at Smart returning, tho . Sigh. I love Marcus, but I would never sign him to a long term deal at this price. He is way too limited offensively. He shot 21% from the three point line in the Cleveland series for example. Well you better pay attention to his hand. Are we seriously concerned that that would somehow make a noticeable difference in terms of shooting percentages, lol? Yes. he's in the low 30's with a healthy hand, 10% is huge difference. 44/4 would be a very good deal. Locking up Smart in his prime for 4 years, tradeable contract, still provides some upside that he could outperform it. Meh, it’s a pretty small sample size that could largely be attributed to rust due to him missing nearly six weeks and being unable to shoot the majority of them. A good shooter would need time to get back to normal, so it’s easy to believe it takes longer for a poor one to regain their mechanics. And since his playoff free throws were right in line with his regular season mark, no reason to believe his hand will hinder his shot. I always found it odd that the people best equipped to evaluate Smart for his intangibles don’t realize his worth to a ball club. It would be understandable coming from generic NBA fans, but coming from people that watch the games? He has a purpose on offense and defense. On defense, he’s an absolute menace. He has quick hands. He has amazing lateral movement and reflexes and can keep his body between the defender and the hoop (sounds trivial but reAlly hard to do in the NBA) with the first step on these guys. On offense, he runs the plays, gets an offensive rebound, and lets our amazing shooters do their job. If you’re going to call him limited on offense, maybe that’s correct (really a subjective word), but then you’d have to throw Ben Simmons into a similar bucket. I’d rather have a 30% 3pt shooter than a no 3 pt shooter. If you don’t even attempt open 3s in the NBA your uncontested average is probably a maximum of 25%. Anything above that and it’s worth taking the point per possession loss(investment) to keep the defense honest. I have no doubt that if Smart were on a garbage team he’d be able to put up 15 points a night on more strightforward opportunities. It’s only in our offense type (find the open guy for the shot) that he seems like the weak link. Still 30% is good enough in my mind. If he ever improves to 33 over the course of this contract, I’d consider it a steal. I value him at 14 million a year based on similar contracts. 4y/46-50 is a bargain. Another thing that cannot be overstated: he’s a great locker room guy and his hustle is contagious. It’s human nature to rise to the challenge and put in your fair share. When you see your brother diving all over the court and sacrificing his body for your team, you want to do it too. He brings the absolute best out in people and I believe that he’s a major reason why the Celtivs have outperformed their expected value for the last 4 years. Morris could slot in the gap as you say but would he? Honestly I think Theis provides more to the team than Morris and Ojeleye may well have developed further than him come the playoffs. I can't see him moving higher than 9th man in any scenario, and I don't think he's mentally equipped for that role in the same way Theis and Ojeleye would be. The thing is that Morris fills a role that none of Smart, Rozier, Baynes, or Theis does, and he's currently much more well-rounded than Semi is (I like Semi, but he needs some more development on offense). Rozier/Smart and Baynes/Theis have a fair amount of overlap in the roles they'll play for the team, but Morris kind of stands alone as a bigger two-way wing. If he asks out because he's headed into a contract year and wants to go to a playoff situation where he'll start that's one thing, but if he's okay with the role he's the best option as far as an off-the-bench guy who could slide into the lineup for any of Tatum/Hayward/Brown while causing the least disruption to the system. I guess this is where I disagree. I don't think he does fill a role that others can't. 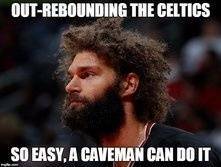 In the playoffs he got a lot of minutes and had the opportunity to have stretches of being the go to guy for a bucket. I don't believe he did that. I don't think we really play bully ball against smaller lineups which negates his impact at the 4, and he isn't a good 3 pt shooter either. Theis can play the 4 on offense if needed with Al in the post, or Tatum and Hayward if we go small. If we did want a bigger stretch 4 then thats where I think the buyouts come into play, someone like Jared Dudley can fill that role in my eyes. Then there is the locker room atmosphere to consider. I don't think he's the kind of guy who in a contract year would be happy to play minimal minutes in the hope that the right matchup comes along for him in the playoffs. Nor should he be, but that does cause a sticky situation. To address some of the other replies as well, it obviously all depends on the amount Smart signs for. If you can stretch Nader and move Yab that is preferable of course. If that doesn't bring you under the tax then it's not an option. On the buyout pile, we have had successes in the past as pointed out in the thread. PJ Brown does count, in the same way a mid season addition of Ray Allen would count (something I could be on board with), and Nate the Great was mentioned as well. KGLL does bring up a good point about matchups, my view of that is we had the opportunities to do that last playoffs and I didn't see Brad utilise it much. We trust our way of playing and to be honest I think the success speaks for itself. GreenEnvy raises the point of utilising Morris early in the season. I don't disagree with that at all. We wouldn't have to move Morris before the season starts, only by the deadline. I think we are prepared to pay the tax this year if necessary, it would just be ideal not to. Giving him time at the beginning of the season may in fact increase his rep around the league and make a trade easier. Or, depending of Smart's cap hit, we may bring a player back at a lower salary. I'll give him the benefit of the doubt on the hand because he wasn't able to shoot for a significant period of time while the injury was healing. By no means am I claiming he can or will become a good shooter. However, I don't think we should ignore his playoff 3 point percentage during the prior two postseasons. Marcus shot 38% on 105 attempts during this time. This was during a 24 game sample. I think a $12/mil per year contract is absolutely perfect for Smart. No need for me to rehash the intangibles. All I know is that he coaches and teammates have complete faith in his ability to help them win important games. Below is a list of players making $12 million or more per year. I tried to keep it to players who are in the middle of their careers. How many of these guys actually impact winning? I see a decent amount of inefficient scorers who don't move the needle on defense. There are also a couple of one dimensional big men. I am NOT saying that Marcus is definitively better than every one of these guys. The list is more or less to show that $12 million per year is fair value for the impact that Marcus brings to the Celtics. $12 million also reflects his shortcomings as a shooter. If Marcus was a 35%+ three point shooter then he would have received a similar offer to Zach Lavine. That Mahinmi contract looks just awful..
Is it possible year 1 is around 14, taking us all the way up to the Apron, but then year 2 drops all the way back to around 11 or so, taking us back under the tax..
No. Annual raises or decreases are limited to 8% of the first year value of the contract. Source says Danny Ainge and Happy Walters are meeting tiday in Boston.